The nomads of Phala reside 200 miles west of Lhasa on Tibet 's cold remote "northern plateau" at altitudes between 15,000-16,500 feet. As they have done for thousands of years, these nomads subsist by rearing sheep, goats, yaks and horses, consuming the products of their animals and using some to trade with farmers and traders for grain, tea and other consumer products. Sheep have been traditionally raised and are their economic mainstay. 1. To provide impoverished nomad families with a five-year loan of reproductive age female sheep in order to foster their attaining economic self-sufficiency. 2. To simultaneously create a SELF-PERPETUATING "sheep bank" that will be able to continue to loan sheep to poor households after the end of the project. 3. To assess the efficacy of the trial project and determine its utility for other nomadic pastoral regions in the Tibet Autonomous Region. Professor Goldstein, the governor of Nyingo xiang (district), a xiang worker, Gen Yonden (field representative for project). Nyingo, Pala, 2000. Pastoralists (pure herders) comprise an important segment of the TAR [Tibet Autonomous Region]'s rural population, and roughly one quarter of the total population. Since the disbandment of the pastoral communes in the early 1980's and the introduction of the household responsibility system, a serious problem in pastoralist areas has been the emergence of a stratum of impoverished nomad households. These poor nomad households own only a few livestock (less than 30 head of livestock) and subsist mainly from welfare from the local administrative area (xiang) government. The local governments have been unable to garner the resources needed assist these families to improve their economic status and rise above the poverty level. As a result of a longitudinal research project conducted from 1986-1997 by myself and Dr. Cynthia Beall, and Dr. Ben Jiao in two nomadic pastoral areas in Nabring district (west of Xigatse and Lhatse), we became convinced that there is a cost-effective solution to the problem of the long-term poverty of a segment of the Tibetan nomad population. The result was to create on a Trial Basis a revolving sheep bank that would lend fertile female sheep to poor families for five years, allowing them to keep all the products (offspring, milk, wool, butter and cheese) from these borrowed sheep and requiring them to repay the same number of fertile female sheep, half in the fourth year and the remaining half in the fifth year. This approach will ensure that this aid is not a one-time grant to temporarily help families but rather will allow recipient households to attain economic self-sufficiency. It is also a way to establish a self-perpetuating animal bank in the area that would be able to continue to assist needy families indefinitely. Because overgrazing is not a major problem in this region, a sheep bank project seemed ideal. 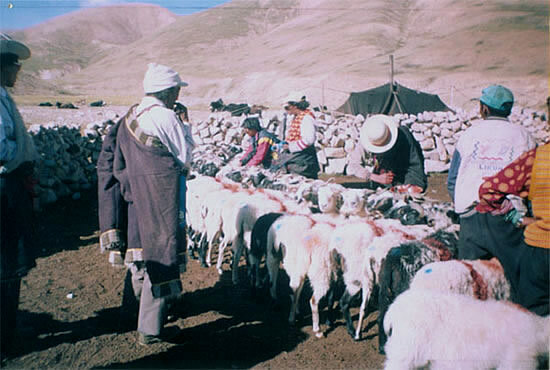 With the financial assistance initially of BODHI (www.bodhi.net.au), and then from The Bridge Foundation, the 5 year trial revolving sheep bank was begun in August 2000 in two nomad areas (xiang). Each year 4 impoverished nomad households (2 in each area) were given a loan of 50 ewes (fertile reproductive age female sheep). These ewes would be purchased from richer nomads in the same area with project funds. The project provided funds to the two local governments (xiang) to purchase 100 ewes in year 01 and in each of the next four years (see attached table). Households will repay \xBD of their loan in year 04 in fertile female sheep (without interest), and half in year 05. From year 05, the Sheep bank will be receiving 100 ewes per year in each xiang so will be completely self-sufficient. 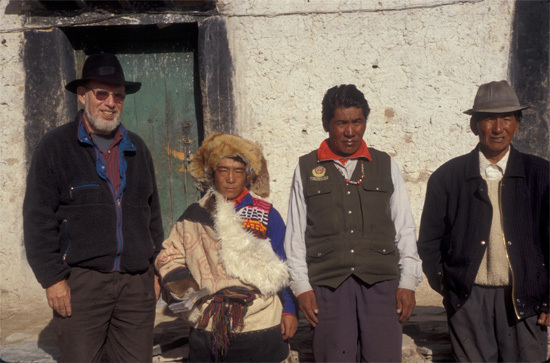 The Trial was successful and beginning in 2007, with funding from The Bridge Foundation, the program was extended to ten more nomad groups in these two xiang.